Hi, I am interested in your 1990 Jaguar XJ6 (stock #1739-TPA) listed on Autotrader for $14,995. I'd like to get more information about this vehicle and confirm its availability. A classic Jaguar sedan is an everlasting symbol of affluence and distinction, so we promise to keep this economy price a secret. 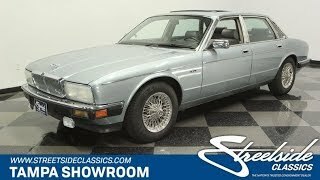 But this 1990 Jaguar XJ6 Vanden Plass appeal is more than just its affordability. And with only 29,405 original miles, this one purrs like a good cat should. Jaguars reputation for smoothness, performance, and old-world luxury is reflected in this handsome sedan. It has been properly maintained throughout its life, a fact demonstrated by the beautiful and correct Diamond Blue paint. This hue still looks fantastic, and so it tells you that this ultra low-mileage car was a garage-kept cherished toy. But like any good finely crafted European product, the quality is in the details. The brightwork around the windows looks amazing; the full-length trim highlights the sporty profile with an almost unbroken line; and the factory wire wheels are pure rolling elegance. This was the first year for the rectangular headlights, which was a short run of distinction that never lost the iconic silhouette that made the XJ6 an iconic of sporty luxury. The Savile Grey interior is a finished to the standards of the grand English tradition that you can still find on cars like Bentley and Rolls Royce. And these comparisons are easy when you sit inside and are surrounded by luxury materials like the leather, wool, and wood - all of which were finished to craftsman level standards. In fact, those who know Jaguars, know that a Vanden Plas is the upper echelon of the already premium Jaguar name. It has exclusive features, including more wood, rear tray tables, and individual rear seats. The comfort continues with a long list of desirable features such as a power sunroof, power seats, power steering, power locks, cruise control, original AM/FM/cassette stereo, and a digital readout center that goes along with the large round analog speedo and tach. They even upgraded the air-conditioning to R134a to make sure everyone remains comfortable. 1990 was a great year because all-aluminum multi-valve engine was increased to 4.0-liters. This is represented so nicely, right down to the factory decals. So it points all signs to being the original powerplant. This fuel-injected motor is a smooth operator, and its backed by a smooth-shifting four-speed automatic overdrive transmission that works with the iconic J-gate shifter. Youll love this Jaguar because these have always been one of the best handling luxury sedans coming straight from the factory. And a fully independent suspension and four-wheel disc brakes all makes for the perfect package to attack the backroads on a weekend getaway. This has been so well loved that even the original window sticker comes with the sale. Jaguar cars have always been for the elite, and the Vanden Plas is the top of the order. So finding a well maintained example that has averaged barely over 1,000 miles annually is a true rare gem. Call today!! !